Not really. Well, I guess when you think of it, really. The cats, for sure. They are too “helpful.” Even my shy girl, Chloe. I had to lock the boys, Henley and Jean-Luc, in the kitten room on the day the guys were laying carpet, so they, the cats, wouldn’t escape through open doors. Chloe, with Jean-Luc-the-Terrible out of action, casually strolled down the hall on the new being-installed carpeting, threading her way between men pounding nails. Wednesday, last Wednesday, April 24, was my last day to box things up before Exile. My plan was to box up delicates: little crystal figurines in their glass display box, dishes stored in the buffet, a couple of old-fashioned school clocks, a few more paintings, some ironstone animal carvings. The guys could take down the two stained glass hanging lamps made by Mom and Dad respectively. The paintings did come down and get bundled. The crystals were packed, as was their glass box. Then I looked at the étagère, at the old tape deck and turntable there. The old stereo tuner-amplifier had already gone home with the electrician who thought he could put it to use. I want to keep the other two . . . lots of old vinyl records (which are making a comeback) and tapes I want to digitize "someday." I could make space for those two on the current sound system by tossing my favorite old VCR, whose timer-record feature no longer does, and my original DVD player, probably never used since I got the sound system, which includes a much better DVD player. Suddenly it dawned on me that the most urgent thing to do would be to label and unplug a bazillion plugs theoretically hidden behind the TV so that I could restore the configuration without having to rethink the whole cabling arrangement. Then there were the wires to all the speakers, even the so-called wireless ones. The guys would know how to wrap delicate things, but only I would understand all my little coded tags for my mini Home Theatre. It took until the wee small hours to do that, and I never did get the chance to sneak around the hall barricade and into the bathroom for a hot shower. 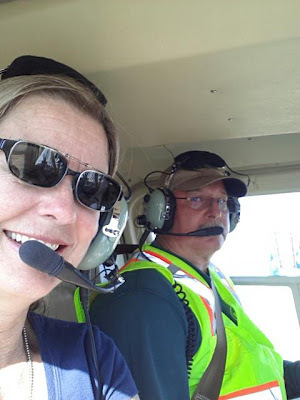 First thing Thursday morning, the kids got sequestered in the back of the car and watched with wails of protest as I hauled everything out to a pile on the deck that I would have to come back for to take to Sister's luxe Garage Mahal temporary accommodations. Craig and Tom had already started behind me, moving stuff that had earlier been moved into the old study now into my revamped bedroom. After delivering the kitties to Garage Mahal, Sister and I headed for Thursdays Out at NeedleCrafts and afterward went to the Little City Down the Hill to get educated about and buy the track lighting for my design wall. I didn't get back to the house to check on progress and pick up my stuff until after six. The move wasn't complete, but Craig or Tom had moved St Francis to his niche at the end of the newly painted and carpeted hall, lit by sun streaming in through the new study's windows. If Mama and Papa are looking down from somewhere, I hope they'll see the little space prepared for their beloved sculpture. All my stuff, piled outside on the deck for easy loading into the car, had been taken diligently back into the house when all the workers left. Argh! The suitcases, primarily portable dressers, didn't weight much, but there are a couple of heavy boxes of paperwork there, too. There's the TV, sitting by itself, with all the cabling and entertainment devices absent. Stashed somewhere else. Here? In the new study perhaps? I recognize things from the kitten room. Ah, yes. They're packing up the china from the buffet. My faith is not misplaced. And here you see my portable wardrobe closet and dresser, containing the necessaries that I didn't pack up when I moved to the living room floor. They're now in my garage, from which I can fetch a change of clothes. Back at Sister's house, here's a representation of what happened (to her, the masculine photo not-withstanding). After breakfast on Friday, as Sister and Brother-in-Law were finishing up last minute correspondence and so forth before leaving for an overnight trip, Sister stood up at the table to hand something across to BIL. I saw the cup tip as she brushed over it. I saw an arc of black liquid project out of it in slo mo. I saw the blob land on the keyboard of the MacBook Pro with a splash. She didn't seem to notice at first, but I think BIL did. Have you ever Googled "coffee spilled on Mac keyboard?" It doesn't sound promising. It voids the warranty, as does opening up the Mac, so there's no point to not opening it. 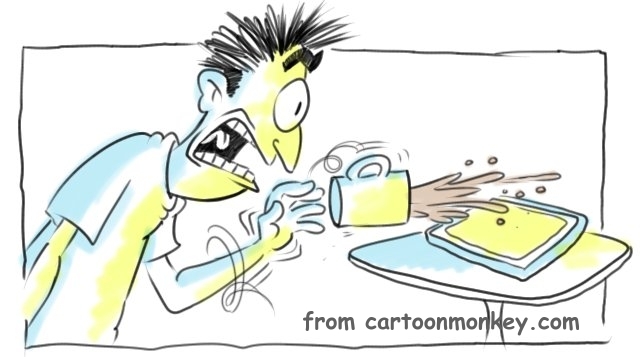 Coffee itself is one of the worst possible liquids, so it seems. Placed with keyboard upside down on a paper towel, it drained and drained, so BIL opened it up and mopped out still more coffee. The warnings said not to try to start it for 72 hours, and if it didn't work then, it was toast. The Mac pieces got consigned to a downstairs bathroom to dry where the door could be locked against their three curious cats. Have I mentioned that they have three Burmese cats, too? One of which is Henley's litter mate? Triple trouble. Friday afternoon and Saturday morning have disappeared in the sands of time, but my photos show that when I finally got back to my getaway hide out about Saturday noon, my triple troublemakers had bowled over a lamp, which now didn't work. Here follow several cute cat pictures, because they're my cats and I like to take their pictures. I also picked up a new cat tree for them on our light-buying expedition on Thursday, which turns out to have been an inspired purchase. Hah! Chloe CAN get to the top of the tree. Daughter did a car swap with me a few weeks ago so I could take her car to my mechanic here to take care of a problem. This Saturday she returned for the swap back. Sister and BIL arrived home from their jaunt later in the evening, and it couldn't be resisted: BIL screwed the MacBook back together and fired it up after only about 36 hours. It works! Needless to say, Sister is delighted she doesn't have to go out and get a new laptop. 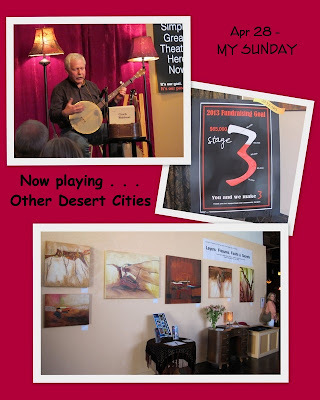 I have season tickets to Stage 3 in Sonora, and had a seat for the Sunday performance of Other Desert Cities. I had a hard time remembering the title until its etiology was explained in the dialogue: When you're eastbound on the I-10, you come to a turnoff for Palm Springs, and the freeway continues on toward "Other Desert Cities." I sooo know that sign. It was a very good play, well performed once it got rolling after a few early pauses where I felt an actor was fighting to pull up the next line. I confess I have a terrible problem with afternoon performances. Chalk it up to never getting enough sleep, but in the darkened theatre it's a battle to stay awake, no matter how fascinating the play. I listened hard. I listened and thought I was hearing it all, even though my eyelids fluttered. At intermission I made a beeline for the coffee and a nice Nestle's Crunch and was completely and totally awake for the second half. I'd drink coffee before the plays, except for being afraid it would, er, come through before intermission. Chuck Waldman plays the banjo pre-play, and there is an exhibit of paintings of earth features one might well find in the desert. If you live within driving distance of Sonora, California, try to see Other Desert Cities between now and May 19. After the play I went off to the hardware store to look at closet solutions. I do not want just a shelf and bar like the old one. Neither do I want to spend a fortune to hang up my clothes. I've looked at a catalog Sister has shared, and these do-it-yourselfers at the hardware store. This looks nice and feels substantial. Not necessarily for the closet but some nice boxes in even more sizes than is shown here. I'm a sucker for boxes, and these have straight sides, handles and stack neatly. Sister makes a beautiful fruit and cottage cheese plate for our Monday lunch. She's doing some special kind of counting thing for Weight Watchers this week, so I'm being provided with real food and we're spurring each other on to walk. Healey has been told she can't lie on the table, so she isn't. BIL's computer case has been preempted. Our April Photo A Day for the 29th is "what you wore today." I didn't dress up. Internet connection is dicey here. Inside Sister's house it's fine, but I can't stay in there all the time, and the connection in Garage Mahal ranges from one bar to two bars with frequent drops. So, I'll see you when I can.